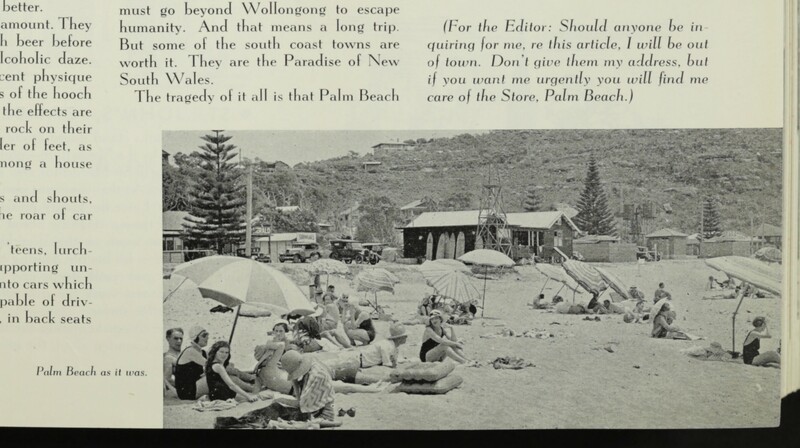 The discerning amongst us are agreed that the summer season at Palm Beach, N.S.W., reaches an all-time high in the offensiveness of its habitués. I was ruminating about it at length the other night, as I lay half-asleep on the verandah of a secluded hide-out, well up on the Hawkesbury reaches, where we have been driven by the advancing horde of the tripper and the pseudo-socialite. There, while the vigorous mosquitoes passed the haunted hours in doing power dives down towards my face (pancaking with considerable force on the netting) I thought of the grim tragedy of it all. Do you remember, not so many years ago, when that over-rated, but at least protected, sand-spit was a comparative paradise? It was not frightfully well known, and there were about twenty houses tucked about in its wooded hills. On the beach foreshore were the store and one or two houses. The sand was clean, and, I am convinced, not as viscous as to-day, when it is permeated with the treacly sweetmeats of the unwashed. You would wander down to the surf about ten, and maybe make a merry morning crack at the local cop, who had pedalled all the way from Narrabean [sic] to see that all was well with the residents and to drink a bottle of beer at various cottages. On the beach would be about fifty people, most of whom you knew, the majority of whom you liked. There would be a dozen gay umbrellas, and lots of laughter and talk, and lots of swimming, and a terrific amount of just lying in the sun. And in the evenings there would be cool verandahs and cocktails, and visits to other cottages. 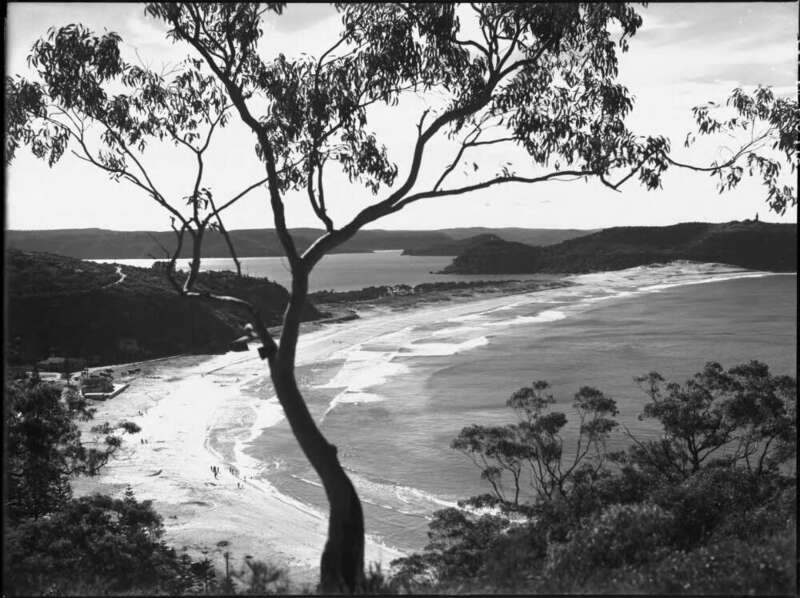 And maybe launch trips on Pittwater, or walks up Barrenjoey. 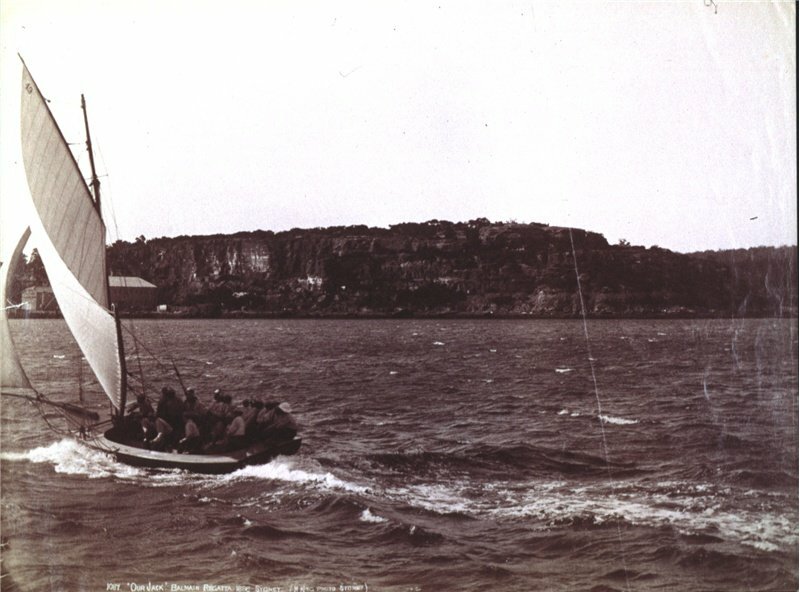 A fortnight at the place was the best tonic to be found anywhere within fifty miles of Sydney. But to-day people are prepared to pay up to 30 guineas a week just to spend the summer days in the centre of an odour. Do you see the subtlety of those words, “pay up to 30 guineas”? It means that the owners of the houses are well away from the place, thanking their stars that such people exist as will hire their homes while they themselves are enjoying a holiday somewhere among reasonable people. I know a couple of house-owners in Palm Beach—and they vow that they would no sooner think of spending Christmas or New Year within 40 miles of the joint than they would fly to the moon. Any normal morning at Palm Beach to-day the beach is littered with cars by 11 a.m. By 12 noon it is packed, and the wafts of air which rise from the hot car bodies and bonnets almost obscure the foreshore houses. At 12.30, when the heat is really on, the insidious smells from the acres of consolidated campers begin to creep around the corner and on to the beach: smells of cans which once contained camp pie, smells of prawn shells, of potato peelings, of primus stoves, of baby food, of humanity, of all the things which, en masse, are offensive. And in the afternoon, as the parking attendant is walking along the cars extracting sixpence from each driver (shades of Bondi! ), the beach is so crammed that one can hardly turn over. The campers have descended on the place, and sprawl around in dirty shorts or long pants. Mothers chase their errant children about the beach, and, having caught them, start to dry and dress them in the public view. Inside cars men and women attempt to undress themselves and to struggle into bathing costumes. Under hastily erected canopies they open their lunches, one long line of picnic lunches, and with the sand lowing in the raspberry jam, they eat. And eat. And eat. Then they systematically dispose of paper by crumpling it into little balls and throwing it on to the beach. Here it lands, unfolds, and blows about during the afternoon. On the hot, steamy asphalt road, leading along the foreshore, humanity parades all the day, clad in every sort of attire. There are people in their Sunday best, blue serge suits, stiff collars. There are the best collection of hideous blazers ever gathered in any Christian country. There are screaming, yelling children, and gawky girls whose backs have nearly been burnt off them by the sun, so that now they present red, raw spaces, steaming with coconut oil. People everywhere are eating ice creams, chewing sandwiches, or munching sweets. In the grassy plots between the foreshore houses they are even doing a bit of peaceful summer noonday necking, locked in one another’s arms. But what, you say, what about the occupiers of the houses? Are they willing to take all this? Are they in the middle of it, moving and having their being? Are they not in retreat, in the hills, hiding from the fury of Suburbia? Of course not. They love it. They are no better than the trippers, no more to be commended or condemned. They are at home among them. They are Suburbia just as much as the trippers, the difference being that the tripper can afford a day or a week-end, bus transport, and a tent, while the Palm Beach holidayer can afford a car and the price of a cottage. That is the dreadful part of it, perhaps even more distressing than the trippers and the campers and the smells. It is the pseudo-socialites, lying on the beach in their gay wraps, imagining themselves the be-all and end-all of exclusiveness. Who are they, and from whence did they come? Who knows? It is obvious why they come. They, in the first place, were attracted by the Palm Beach myth; they imagined people of great wealth and power, lying on the beach picking at caviar and getting stuck into magnums of champagne. They came, they saw, they were disappointed. But they stayed, because they had the wealth to turn on the luxuries which the real people did not trouble to turn on. They came in greater droves, formed their own society, their little cliques, their unpleasant groups. And the more they came the more the real people fled, content to let their houses to the nouveaux-pseudoes. And so the new people found they had the beach to themselves. It became their domain; and they ruined it. Now they can keep it.